began the Ol' Yaller legend when he drove the Mk.1 car in partnership with Max Balchowsky. Ol' Yaller Mk.1 leads at Riverside in June, 1958. Eventual winner Bob Oker challenges in his Aston Martin DBR2. Don Hulette in his Jag-Chevy and John Von Neumann in Ferrari Testa Rossa #0710 are next. Skip Hudson careens after them in the Arciero entered fiberglass- bodied 375-MM Ferrari #0362. #211 Richie Ginther, in Von Neumann's Ferrari 860 Monza #0604, ultimately finished 2nd. When the partnership ended, Eric took the car (#1 here) and Max continued his development of the Buick engine. Hauser's best race in the newly-Chevy powered Mk.1 came at this Palm Springs event in January, 1960. 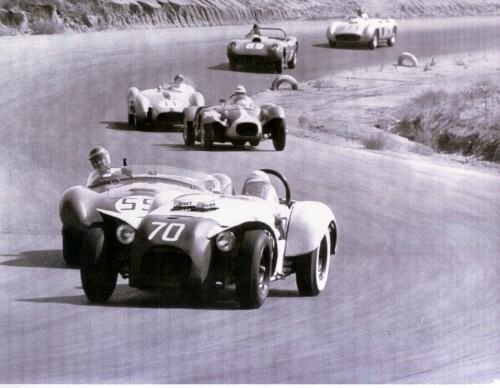 He led Bob Drake in Joe Lubin's "Birdcage" Maserati #2452, Max Balchowsky in his brand-new Buick-powered Ol' Yaller Mk.II, and Jim Hall (2nd row) in a 5.7 liter Maserati 450-S #4505. Hauser led these top-notch competitors and others for 17 of 20 laps until his transmission broke. Drake went on to win. Painted blue and still Chevy-powered, Ol' Yaller Mk.1 ran as the Larkin- Hauser "Lioncage" later in 1960. The "Lioncage" was as fast as any Birdcage. 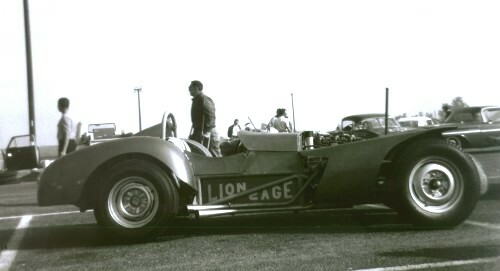 Hauser won his amateur preliminary race at Laguna Seca and qualified the "Lioncage" for the first Pacific Grand Prix. He didn't finish but the colorful driver in his striped racing shirt put on a great show for the spectators. (4-27-05) Joe Scalzo's article on Eric Hauser (from 1961)! Mike Larkin now owns Ol' Yaller Mk.1 -- see it as it looks today. Thanks to Mike for the photos & info. All photographs and text are the property of Tam McPartland and Mike Larkin and are protected under United States and international copyright laws. All rights are reserved and the images and/or text may not be digitized, reproduced, stored, manipulated, and/or incorporated into other works without the written permission of the writer, Tam McPartland, and the photographer, Mike Larkin.